Van Cliburn: Treasuring Moscow After 50 Years Fifty years ago, a tall 23-year-old Texan shook up the music world by winning the first Tchaikovsky Competition, in Moscow at the height of the Cold War. 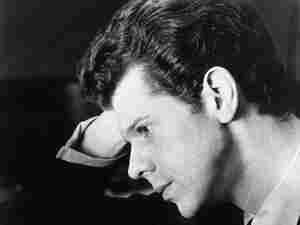 Van Cliburn reminisces about his victory and his unconventional career. 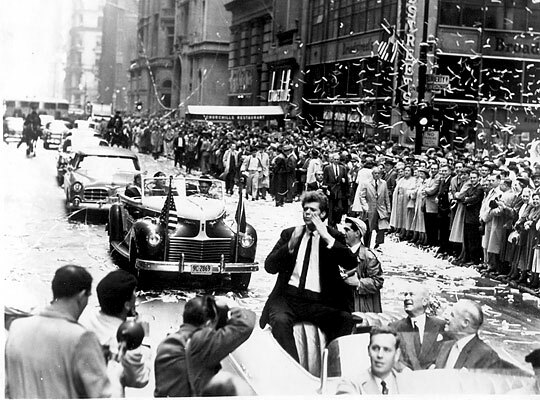 Van Cliburn at his ticker-tape parade on Broadway, in April 1958. He's the only musician to receive such an honor. 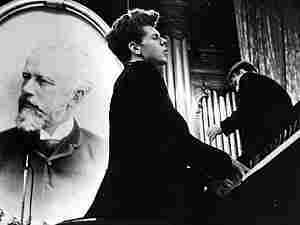 Hear Van Cliburn's hit recording of Tchaikovsky's Piano Concerto No. 1, recorded at Carnegie Hall on May 30, 1958, just six weeks after winning the Tchaikovsky Competition in Moscow. 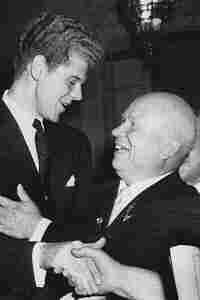 Soviet Premier Nikita Khrushchev gives Van Cliburn a congratulatory embrace after Cliburn's victory at the first Tchaikovsky International Piano Competition in Moscow, April 1958. In the 1950s, more than one big-haired kid from the South shook up the world with the way he played music. Van Cliburn was a lanky and laconic 23-year-old from Texas when he won the first International Tchaikovsky Competition in Moscow on Apr. 14, 1958. It was at the height of the Cold War, with the U.S. and the Soviet Union posturing over Berlin, nuclear tests and the space race. The competition's judges reportedly asked Soviet Premier Nikita Khrushchev if they could really give first place to an American. Khrushchev replied, "Is he the best piano player? Then give it to him." 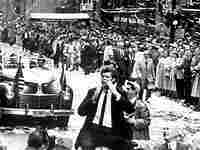 Cliburn returned home to a ticker-tape parade in New York, as well as international celebrity. His recording of Tchaikovsky Piano Concerto No. 1 was the first classical recording to sell more than a million copies. 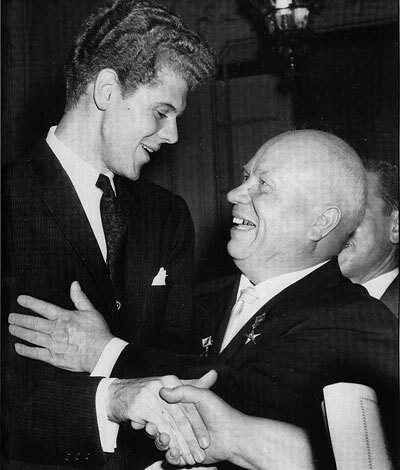 With his Moscow victory, Cliburn became something of a diplomat, striking a chord that connected common people from two countries that were bitter enemies. He'd never been outside the U.S. before his Moscow trip. "The memories are so vivid," Cliburn told NPR's Scott Simon. "I remember the evening I arrived [in Moscow, on] March 26, 1958 — people were so friendly. One of the landmarks of the world that I had treasured the memory of seeing, when I was 5 years old, was the gorgeous photograph of the church of St. Basil. And so I asked this very nice lady from the ministry of culture if it was possible to pass by and see the church. She said, 'Of course,' and so we drove past it, and I felt like a dream had come true." Cliburn's life at the piano began at age 3, when his mother found him at the keyboard, mimicking the piece of music that her piano student had just played. She asked young Van if he wanted to play the piano. When he said, "Yes, mother," she said, "I'll teach you. You're not going to play by ear. You're going to know what you are doing." Cliburn's mother, Rildia Bee O'Bryan Cliburn, a pianist who studied with one of Franz Liszt's pupils, was his principal teacher until he entered Juilliard at age 17. He recalls that she always made him sing the music before he played it. During one of his return visits to Moscow, Cliburn invited her on stage to perform. Cliburn's first public performance was a Bach Prelude and Fugue at age 4. He made his debut with the Houston Symphony at age 12. He also played clarinet in the Kilgore, Texas, high-school marching band. He recalls that because of his height and large hands, the school tried to recruit him for the basketball team. In 1954, Cliburn won the Levintritt Competition, which opened doors to playing with orchestras in Cleveland, Denver and Pittsburgh, as well as with the New York Philharmonic, conducted by Dmitri Mitropoulos. After the Tchaikovsky Competition, Cliburn's schedule was hectic with tours and recordings. In 1962, a group of friends sponsored the first Van Cliburn International Piano Competition, in Fort Worth, Texas. Cliburn went into semi-retirement in 1978, but returned to the White House to give a formal recital during a 1987 summit meeting between President Reagan and Soviet General Secretary Mikhail Gorbachev. It was the first time the famed pianist had taken the stage in nine years. These days, Cliburn rarely plays in public, but still practices every day — often, he says, in the middle of the night. "You feel like you're alone and the world's asleep, and it's very inspiring. I was never really the type that needed the stage. I love music. I love listening to it. But when you just listen, you can be 100 percent; when you have to serve music, you must be thinking of others, not yourself." Listen to a newsreel featuring part of Van Cliburn's actual prize-winning performance in Moscow. Though Van Cliburn won the first Tchaikovsky competition, he isn't the only American whose career was boosted by the opportunity. Pianist Daniel Pollack also won a prize, and spoke with NPR's Scott Simon about the experience. Fifty years ago, a tall, curly-haired Texan pianist named Van Cliburn was given the full hero's treatment upon his arrival in New York: a ticker-tape parade, complete with a declaration by the mayor. How was it that a classical musician could inspire this kind of idolatry? It all started with Tchaikovsky — specifically the first International Tchaikovsky Piano Competition, held in Moscow in 1958. It was part of a movement toward a thaw in the Cold War, after a period of complete dissociation between two superpowers: the U.S. and the U.S.S.R.
Part of that thaw was a cultural exchange. The idea was to invite international musicians to compete with Russians for a grand prize, and to show off Soviet accomplishments in the arts. A group of 50 pianists from 19 countries went to Moscow, including a few Americans. One was Van Cliburn. He had won an American competition, the Leventritt Award, at age 20, only to drift into an unremarkable career. But his prodigious talent had not gone unrecognized by the jury — this being no ordinary jury. Among them: Russian pianists Emil Gilels and Sviatoslav Richter, composers Dmitri Kabalevsky, Sir Arthur Bliss, and Dmitri Shostakovich, chairman of the competition. Cliburn famously tore into Tchaikovsky's first piano concerto, awing the Soviet judges. But they remained unsure whether they could give the prize to an American. As the popularly recounted story goes, the judges sought Soviet Premier Nikita Khrushchev's approval. "Is he the best?" Khrushchev asked. The judges replied yes. "Then give him the prize," Khrushchev said. Sara Fishko examines how 50 years ago, a classical pianist made history.